Finally. A book about FileMaker Pro 10 that doesn't put you to sleep. The FileMaker Missing Manual series is accessible, informative, and fun to read. Seriously. If you like what you read on Six Fried Rice, you’ll love FileMaker Pro 10: The Missing Manual. Written by Six Fried Rice co-owner Geoff Coffey and Susan Prosser, this definitive guide to all things FileMaker is not just thorough and informative. It’s clear, understandable, and — dare we say — a little funny. With real-world examples, precise step-by-step instructions, an encouraging tone, and hundreds of pictures and illustrations, this book takes you from FileMaker novice to experienced developer in 19 focused chapters. Along the way, you’ll uncover hidden tricks, explore even the most esoteric dialog boxes, and learn how to solve real problems with sound relational design and powerful scripting. 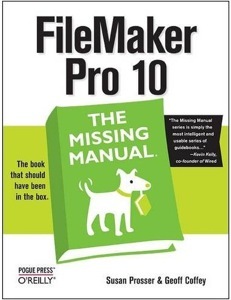 FileMaker Pro 10: The Missing Manual is truly the book that should have been in the box. Many technology books are out of date the moment they hit your mailbox. But in FileMaker Pro 10: The Missing Manual you’ll find complete coverage of every new feature in the just-released FileMaker Pro 10. You even get access to easy-to-follow on-line screencasts and downloadable sample files. Best of all, since you’re already a Six Fried Rice reader, you know where to turn for the latest tips, exciting examples, advice, and training. Although FileMaker Pro 10: The Missing Manual makes no assumptions (it’s perfectly suited for total FileMaker newbies), it doesn’t shy away from the most complex FileMaker topics. You’ll gain a clear understanding of the ins and outs of relational database design — a notoriously tricky topic that is approached here in a no-nonsense way mere mortals can quickly understand. When you turn your attention to automation, you’ll discover a sensible explanation of FileMaker’s ScriptMaker. But it doesn’t stop there. Three full chapters on scripting cover everything from the new script triggers, to intelligent approaches to complex script design. You’ll even learn how to write recursive custom functions, how to use external authentication, and how to share your database with others using FileMaker Server 10. You can try out all our products free of charge. You can buy the FileMaker Missing Manual from most bookstores. Click the button below to find it on Amazon.com.